The First Church of Belfast is getting a new look, with new granite steps, a brick walkway to Church Street and a new deck that replaces the old, dilapidated one. 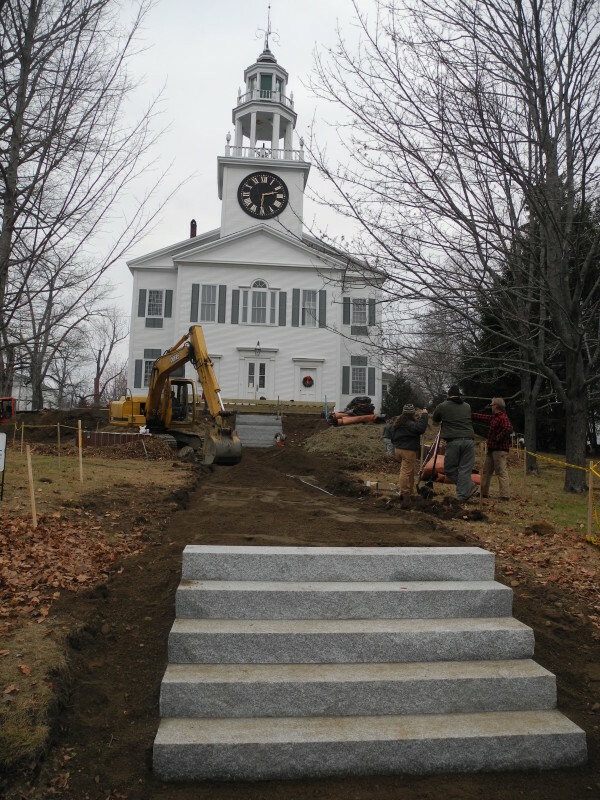 BELFAST, Maine — This fall, one of Belfast’s most recognized buildings, The First Church, is getting a new entrance with a deck and patio, granite steps and a brick walkway. The downtown Belfast church, located at 8 Court Street and home to a United Church of Christ congregation, will mark its 200th anniversary in 2018. Mark Durbin of GO Logic, which is serving as the general contractor for the project, said this week that work began in late November and the new deck and patio must be completed in time for the Christmas Eve service. He said that the new deck will replace a dilapidated one and that wooden stairs will come down into a patio made of brick pavers. The work that is being done will essentially double the flat area on the hillside in front of the church, he said.